Kang La (5450 meters) is one of the most challenging treks of Himalayas with beautiful views and 28 km walk over a glaciar. It's One of the highest passes in Himalayas. Ideal for a well prepared trekker looking for a challenge. Kangla pass connects the Miyar valley of Himachal Pradesh and the Zanskar valley in Ladakh . The Miyar Nala in Lahaul that the trek covers, is famous for its wild flowers in June and July. Kang La has been used by shepherds and travellers for centuries to cross over Lahaul into Zanskar and vice versa. It's a Trans-Himalayan Pass. There is a walk over a 28 Km long glaciar filled with crevasses makes the whole trek a hell of an adventure. The trek is remote and not much frequented, however much rewarding with awe inspiring scenery and views. There are meadows filled with wild flowers and pristine glacial lakes and snow filled mountains wherever we can see and the unparalleled long walk over a snow glacier, which makes the whole experience unique. It's a different world altogether, an ancient land, the kingdom of Zanskar with it's arid land and monasteries built into mountain caves and pristine white Miyar Valley. It's like a journey back in time. It's an easy 12 kilometers trek. 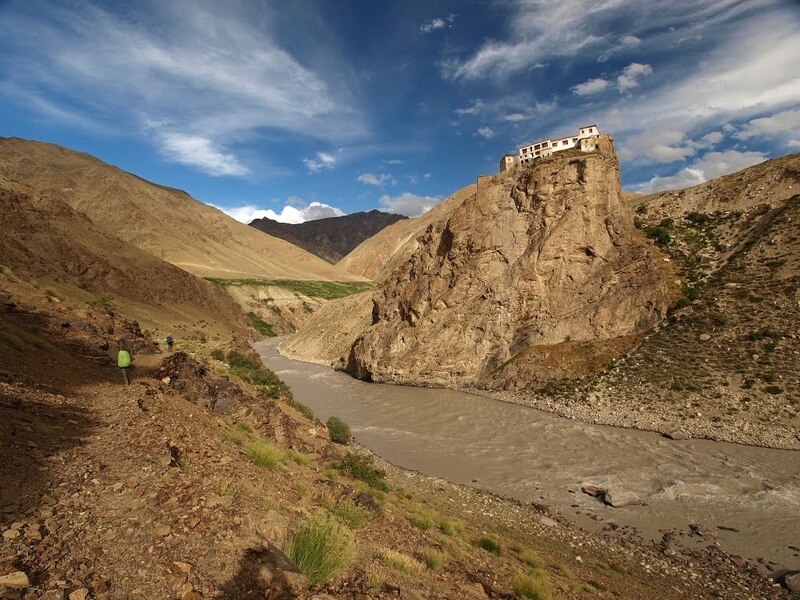 During our trek we will come across Barden Gompa – the oldest Gompa of the region set dramatically atop a riverside cliff. The intense blue of the Zangspo river is a stark contrast against the ocher, grey, adobe and black hillsides; a fitting end to the trek. We make our camp here in the school grounds. We head up towards a gorge and begin our ascent to Kang La Base, We ascend for 6 hours on tiring scree slopes and then easily on an improving path as we follow the Tema River. We trek through grazing grounds and meadows with flowers on a small grass land. Our camp is just above two co-joining valleys. We camp here tonight. We start very early around 4 am to cross the high pass, we climb across boulders and snow fields at times we would require to rope up. All around us are tall peaks, many of them un-climbed and un-named. There are stupendous views from the top of the pass as we can view snow capped peaks and glaciers all around. The pass defines the border between Ladakh and Himachal Pradesh. The surrounding peaks are 6000+ meters and views are breath-taking. Now begin our descend over crevassed glacier, roped up with our crampons and snow boots and carefully descend over the icy Miyar Glacier. We would need to zig zag to avoid crevasses. We camp here on open snowfield in the middle of glacier after a 3 hour descent. We head down often roped up and with crampons and begin our long walk down at the end of terminal moraine to a open site at the end of the glacier also called Khai got by local shepherds. Its at 4200 meters on open ground and a dry lake bed surrounded by mountains and several glacial lakes,overlooking the Miyar Glacier. It's a sheltered camp. We camp here tonight. e walk across alpine pastures among snow capped peaks and glacial views towards Gumbah Nallah. It's a beautiful campside over meadows and wild flowers near a river stream. Again there is a wonderful trek among meadows and wild flowers to reach our beautiful campsite at Tharang. Tharang is the highest settlement of this region and 200 m climb to a beautiful campsite, with numerous snow-clad peaks far side of Chenab valley. Now gentle walk down to the river floor, Shortly after leaving camp, we cross a small river by a wooden bridge and trek through terraced fields against the backdrop of an unnamed peak. We climb up a ridge to a chorten where we get a wonderful view of nearby and distant mountains. Trail leads through flowered meadows and peas and millet fields before re-crossing the Miyar River on a well-constructed bridge to the village of Karput. Chimrat is the first village in the Miyar valley, on the way we make a visit to monastery at Karput. Our jeeps would be waiting for us here to take us to our journey back via Udaipur, Keylong and Rohtang Pass. Rohtang is one of the highest road passes in the world. There are great views of Himlayas as we stop over for photography over the snow laden pass, open only during summers. We stay in our hotel in Manali a very popular tourist town in Himachal. Click here to know what else included in your package?